According to the European Commission and NIHR Clinical Research Network, between 2007 and 2011, delays for launching clinical trials rose by 90%. And with approximately one third of the clinical trial timeline spent in patient recruitment, delays in launching clinical trials will increase costs and drain resources. As our industry moves to become fully and demonstrably patient centric, there is much focus on the materials and media which are often the key liaison with the patient populous. As important as what we are saying and where these conversations are taking place may be, it is only part of the conundrum. Developing, maintaining and managing content is a continuous challenge, made all the more taxing not only by strict internal deadlines but the cultural, linguistic and regulatory challenges that go hand in hand with managing global communications. 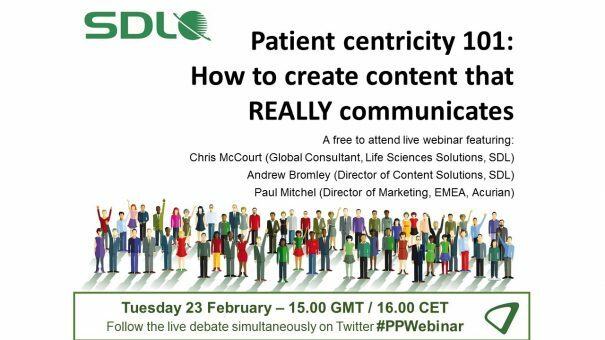 Working with our expert partner SDL, we present a live webinar which delivers insight and guidance on this topic, look in depth at one of the more traditional areas of patient liaison – trial recruitment – and bringing you advice from the ‘frontline’ on what works in tackling these content challenges. Recent case studies: we’ll be discussing recent successes of global pharmaceutical businesses that have optimised and streamlined recruitment processes with relevant, accurate content development in the right language. The live broadcast took place on Tuesday 23 February 2016 at 15.00 GMT (16.00 CET). To view the on-demand version, please click here or on the webinar widget below. Andy Bromley is Director of Content Management Technologies at SDL. A content management industry expert with 15 years of experience specialising in pharma, medical devices, healthcare and corporate content strategy. Andy works with organisations to develop return on investment, identify and develop agile content strategies, implement multichannel publishing strategies and to put governance in place that helps regulated industries comply with complex and rapidly changing legal frameworks. He has a BSc in computer science and an LLB in Law from London University. Chris McCourt is SDL’s Global Consultant for Life Sciences Solutions with responsibility for language services sales, solution deployment and consultancy. Chris leads new business opportunities with global pharmaceutical & medical device companies and contract research organisations, with a special focus on language solutions for clinical development professionals. Chris has been in the industry for over 7 years and has worked across the European and North American regions during his time at SDL. Prior to joining SDL he worked in client-facing operational roles for Life Sciences organisations and strategic business development for global providers of translation services to pharmaceutical companies and CROs. Chris holds a first-class degree from the University of Oxford in French and German. In his spare time he enjoys travel, languages and single-malt Scotch whisky. With twenty years of extensive experience delivering effective direct response marketing strategies and tactics, Paul is responsible for continuing to expand and develop Acurian’s performance based patient recruitment capability outside of North America. Based in Cambridge, in the United Kingdom, Paul’s background in database and relationship marketing helps Acurian meet the growing demand for results-based enrollment services on a global basis.